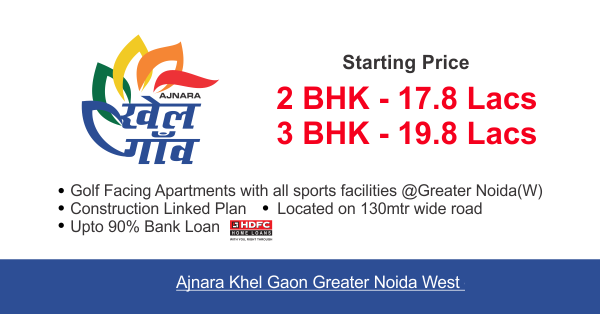 Ajnara Khel Gaon is a project that has been set up on 175 acres of land with all the modern amenities in it. It’s a dream project in the most wonderful location with the best infrastructure that adds to its advantage. The project has got golf ground as the central focus, and thus 75 percent of the land is kept green, which adds to the beauty of the project. The apartments of the project will get ample amount of air and sunlight as they are made following the rules of Feng Shui and Vastu Shastra. It is so planned to provide you and your family the ultimate comfort and the space to enjoy your life. Location of the Project: This wonderful project is located in the Greater Noida West in Uttar Pradesh. The location is the perfect one. The project has got ample space around it and will definitely make the residents feel that they are living in the lap of nature. Most importantly the project is easily connected by the roadways. Moreover, there has been a proposal of metro station. Therefore, the residents of the project can even hope for a metro station soon. The project faces a wide road of 130m that connects it with the Pari Chowk, Noida and NH 24. The main motive of working this prominent real estate group to transform entire process of realty development taking into new heights and presenting as a benchmark into realty sector. Timely deliveries, transparent method and exceeding client expectations are some points that take it highest peak of success. This is the reason why company it has gained huge popularity among its users and rapidly increasing it at fast pace. With its newly launched project, Ajnara Group provides an outstanding residential venture and guarantees top quality way of life that you have never been gets before in your life. From last few decades, demand of getting high end luxurious and comfortable living style is demand of everyone so that people are looking for a well planned and fully embellished residential project. In fact, there are large sum of people who ready to invest a huge amount in terms of extending their lives as per modern scenario. Realizing all the facts and burgeoning demand of people, Ajnara Group geared up to accomplished their need through presenting splendid residential project. From the time of inception till today’s date, it has developed so many luxurious projects and gained tremendous popularity among millions of investors and home buyers. The project doesn’t only provide shelter but also offers an actual gateway to fulfill demand of high standard and iconic lifestyle. Facilities for the residents: The residents of the project will get all the modern amenities to live in this place. The most important thing that is needed now-a- days is security of you family and your property. The project provides you with 24*7 securities with intercom services. Other than this electricity and water supply is there for 24 hours. Children can well utilize the outdoor and indoor sport facilities. The project has got all the fire fighting equipments ready for the time of emergency.